Playing Division I football is hard enough. Graduating with a near perfect grade point average in engineering on top of that is definitely not possible for many. 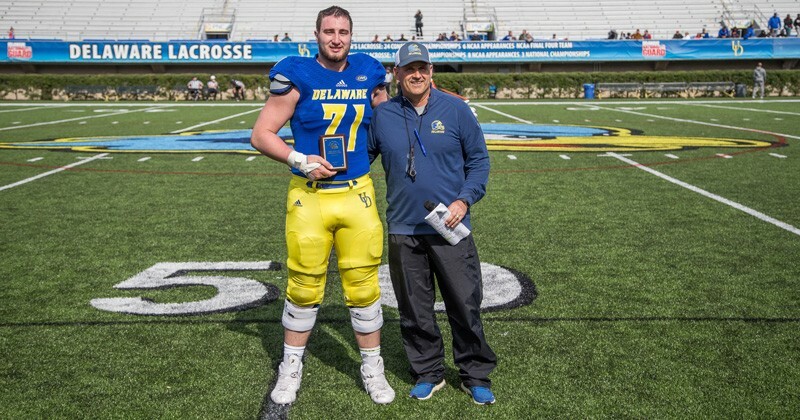 But Collin Wallish of the University of Delaware football program did just that and for his outstanding work both in the classroom and on the field, he was named to the First Team Google Cloud/CoSIDA Academic All-District team. Wallish, a native of Silver Spring, Maryland, graduated last spring with a degree in electrical engineering and will finish his master’s degree because he joined an accelerated program to obtain both degrees. He sports a near perfect 3.93 cumulative grade point average during his tenure at Delaware. On top of that, he played the trombone in a jazz band in high school. He started the first five games of this year, but has battled some injury issues, while helping the Blue Hens out to a 7-3 mark and a possible Football Championship Subdivision playoff berth on the line Saturday against Villanova. For his career, Wallish has played in 27 games, serving as a critical piece of the offensive line over that time. Wallish and his teammates will line it up one final time this regular season on Saturday, Nov. 17 when Delaware hosts long-time rival Villanova. He will be among the 27 senior student-athletes honored at the pregame ceremony that will begin at 11:45 a.m. at Delaware Stadium. To follow results of games involving UD Athletic teams and get more information about Blue Hen student-athletes, visit the website bluehens.com.